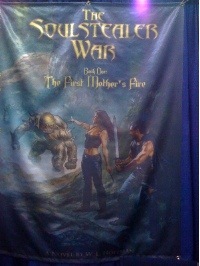 01 Jun 2009 in BEA Book Expo America fantasy science fiction small press books ~ read. I’m always on the lookout for interesting small press and self-published books, and The Soulstealer War, by W. L. Hoffman, caught my interest. 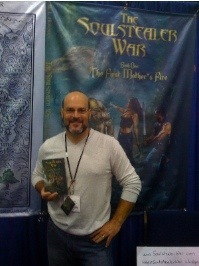 I chatted with the author at BEA for quite a while, and according to him, it’s an epic fantasy with SF elements, quantum physics, and philosophy. 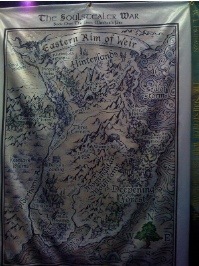 Here’s a wall hanging of the map from the book. The map was drawn by the author and it’s beautiful. I haven’t read the book, so I really have no idea if it’s any good, but it sounds interesting and I look forward to reading it.